Finsch is one of the world’s significant diamond mines and South Africa’s second largest diamond operation by production (after De Beers’ Venetia mine). The mine benefits from state-of-the-art mining infrastructure, including a modern processing plant which was upgraded shortly before Petra acquired it at a total cost of approximately US$100 million. Finsch has produced large, special diamonds in its history and produces a number of +50 carat stones annually. In addition, the mine is known for highly commercial goods of +5 carats and is rich in gem quality smaller diamonds. Mining is currently transitioning from the block cave on the 630mL to the SLC over four levels from 700mL to 780mL. Development of the 11 kimberlite extraction tunnels of 70 level Phase 1 was completed and the tunnels handed over to production for slot cutting and ring blasting during H1 FY 2017. In FY 2018, as a result of Petra’s development plan at Finsch, the Block 5 SLC ramped up further and delivered 1.65 Mt. The higher input of undiluted ore from the new mining areas, assisted by the processing of higher grade surface ROM material, resulted in an increase in the ROM grade from 44.3 cpht in FY 2016 to 56.6 cpht in FY 2017 and on to 62.5 cpht in FY 2018. For FY 2019 the ROM grade is expected to be within a guidance range of 56-59 cpht as the high grade ROM overburden dumps are depleted, although this will be partially offset by the increased ramp up of the Block 5 SLC. Petra’s initial mine plan has a life to 2030, but resources in Block 6 and the adjacent Precursor kimberlite orebody, which sits next to the main body of the Finsch kimberlite pipe, are expected to prolong the actual LOM. The mine has gross resources of 42.9 Mcts. The Finsch kimberlite was discovered in 1960 and the mine was officially opened in 1967. Ore extraction was initially from the open pit. Sinking of the main shaft to access the mine from underground started in 1978. Two vertical shaft complexes, tunnels and ground handling infrastructure were prepared for the continuing exploitation of the pipe with the use of highly mechanised mining methods. In 2008 the treatment plant was upgraded at a cost of approximately US$100 million. On 14 September 2011, Petra purchased Finsch as a fully-staffed, operating mine from De Beers. Finsch is known for highly commercial goods of +5 carats and is rich in gem quality smaller diamonds. 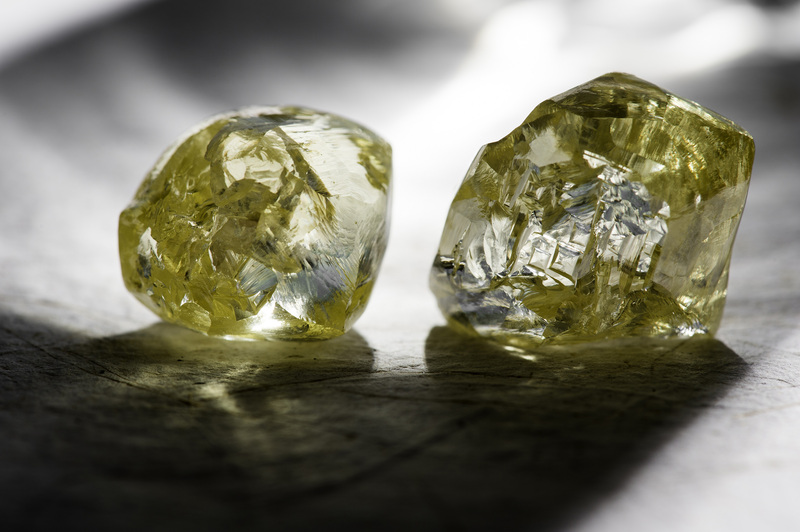 Large, special diamonds are also a feature of the orebody, with a number of +50 carat stones recovered at the mine annually, and the mine also produces very rare fancy yellow diamonds. 3. Block 4 Remnants recalibrated to June 2018 pit scans. 4. 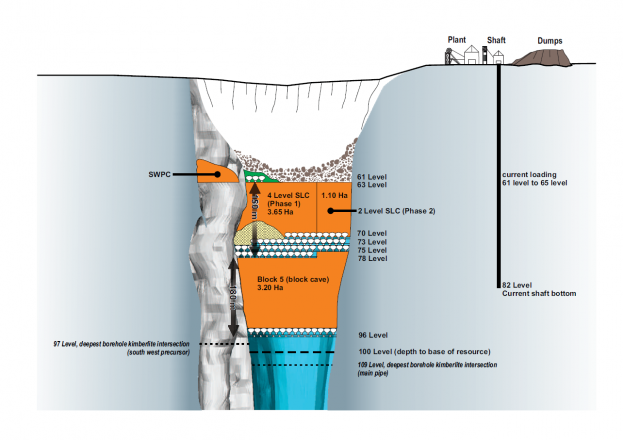 Block 5 Resource stated as in situ. 5. Block 5 Reserves are based on PCSLC and PCBC simulations, depleted for SLC development tonnes. 6. US$/ct values of 105-110 for ROM, based on FY 2018 sales values and production size frequency distributions. ROM production increased 6% to 1,926,467 carats driven by a higher average ROM grade of 62.5 cpht, positively impacted by the treatment of higher-grade surface ROM material, coupled with the increase in undiluted tonnes from the new Block 5 Sub Level Cave. This partially offset the underperformance of ROM tonnage throughput due to lower tonnes from the South West Precursor ancillary orebody (“SW Precursor”), where production was curtailed further to intermittent caving leading to safety concerns around the stability of the ground conditions in the vicinity of the mining area. This is necessitating continual reassessment of the manner in which the SW Precursor orebody can be accessed. Overall production decreased 4% to 2,073,477 carats (FY 2017: 2,149,896 carats), with the increase in ROM production offset by the planned reduction in tailings production, which decreased to 147,010 carats (FY 2017: 331,442 carats). Block 5 SLC ramped up further and delivered ca. 1.65 Mt in FY 2018 compared to 0.75 Mt in FY 2017. Petra’s development plan at Finsch is due to increase higher value ROM throughput from 3.1 Mt in FY 2018 to 3.2 Mt in FY 2019. The Company will continue to assess plans to achieve its longer term throughput target of 3.5 Mtpa at Finsch by investigating options to safely reintroduce the SW Precursor from 73 Level or increasing throughput rates from the Block 5 SLC. FY 2019 planned tonnage from the SLC is ca. 2.7 Mt, with the remaining tonnes to be sourced from the ROM overburden dumps. The SW Precursor is a smaller ancillary orebody (ca. 1.2 ha in size, compared to the main orebody of ca. 4.7 ha), which contains ca. 3 Mt of ore above 63 Level and another ca. 3 Mt between 63 Level and 73 Level. The relatively small size and its proximity to the main pipe affects the ability to induce continuous caving and the stability of the rim tunnel. The ROM grade is expected to reduce to within the guidance range of 56 – 59 cpht for FY 2019, mainly due to the depletion of these high grade overburden dumps from FY 2019, although partially offset by the increased ramp up of the Block 5 SLC. Limited tailings production of ca. 200,000 tonnes is planned for FY 2019, which includes mostly remnants from the higher grade pre-79 tailings. While tailings production post FY 2019 does not form part of the current mine plan, lower grade post-79 tailings material remains available to supplement the underground operations in the future. Petra’s initial mine plan has a life to 2030, but resources in Block 6 are expected to prolong the actual LOM. The mine has gross resources of 42.9 Mcts. The orange blocks indicate the Block 5 SLC and the Block 5 Block Cave that are currently in our mine plan to 2030. The blue block indicates the potential future block to be accessed post 2030. Finsch Diamond Mine (Pty) Ltd (“FDM”) holds a valid new order mining right (the ‘‘Finsch Mining Right’’) dated 15 October 2008. 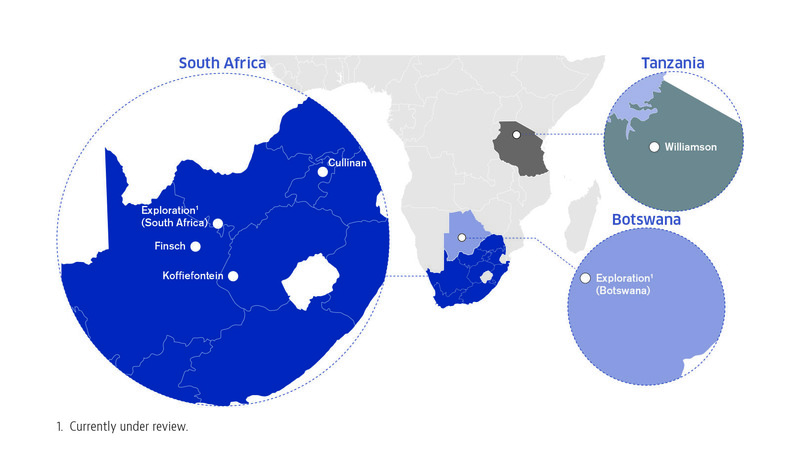 The Finsch Mining Right was initially issued to De Beers under item 7 of Schedule II of the Mineral and Petroleum Resources Development Act, 28 of 2002 (“MPRDA”) and was ceded to FDM by notarial deed of cession on 8 September 2011 and duly notarially executed and registered in the Mineral and Petroleum Titles Registration Office. The Finsch Mining Right confers on FDM the exclusive right to mine for diamonds in relation to the areas it refers to until 14 October 2038. Pursuant to the MPRDA, the Finsch Mining Right is renewable (for periods of up to 30 years for each renewal) on the basis more fully set out in section 24 of the MPRDA. Section 2 of the Mineral and Petroleum Resources Royalty Act No. 28 of 2008 (“the Royalty Act”) requires FDM to pay the South African Government a royalty for minerals recovered under the Finsch Mining Right. Pursuant to section 4 of the Royalty Act, the royalty is to be paid on gross sales in accordance with a defined formula set out in the Royalty Act. The formula applicable to rough diamonds is as follows: 0.5% + (earnings before interest and taxes, as defined in Section 5 of the Royalty Act / (gross sales x 9) x 100) but not exceeding 7%. FDM is also subject to corporate tax in South Africa at the rate of 28% in terms of section 5 and other provisions of the Income Tax Act 58 of 1962. There are no fiscal stabilisation provisions in place in relation to Finsch Diamond Mine.